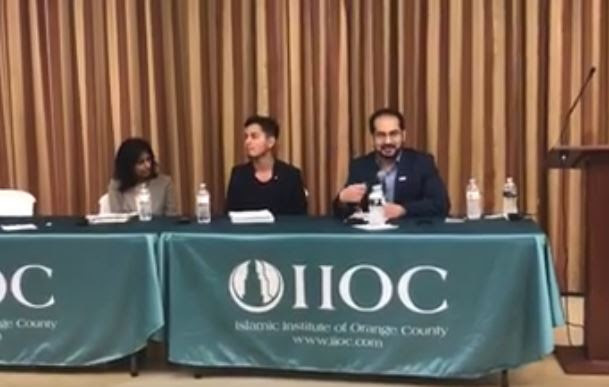 (ANAHEIM, CA – 3/13/2017) On Sundayafternoon, March 12, the Greater Los Angeles Area office of the Council on American-Islamic Relations (CAIR-LA), in partnership with the Islamic Institute of Orange County (IIOC) and the Arab American Civic Council (AACC), hosted a solidarity town hall with civil rights advocates, elected officials and interfaith leaders to discuss how the community can unite against the revised ‘Muslim Ban’. The town hall was held in partnership with the American Civil Liberties Union (ACLU), Asian Americans Advancing Justice (AAAJ), and the Muslim-Latino Collaborative. Over 100 attendees of all faiths, ages and backgrounds filled the room to learn more about how they can unite to take a stand against the revised Muslim ban. CAIR-LA Policy and Advocacy Coordinator Asmaa Ahmed served as the master of ceremonies. IIOC Education Director Shaykh Mustafa Umar began the program with verses from the Quran talking about the principles of justice, and how our response as a community to the injustices we face today in America will set the stage for generations to come. CAIR-LA Executive Director Hussam Ayloush stressed the values and importance of solidarity. He highlighted that despite the severe negative impacts of the ban, the silver lining of the recent anti-Muslim and anti-immigrant rhetoric and policies have been the coming together of the greater American public in a way that has not been seen in recent history. Slogans like “No Hate, No Fear, Muslims are welcome here!” being chanted by people of all walks of life at LAX was a heartwarming example of how these challenging times have brought together the best of America. Mr. Ayloush stated that California can lead the way as a foundation for resistance against any agency or public official, including our president and those who support him, who try to divide us on the basis of religion, ethnicity, social or economic class. Mirvette Judeh of the Arab American Civic Council talked about the purpose of the town hall and the importance of community members being aware of their rights and the resources available to them during these troubling times. She ended on an energizing note, leading the crowd in a chant of solidarity. Following the opening speeches, there was a segment with elected officials including U.S. 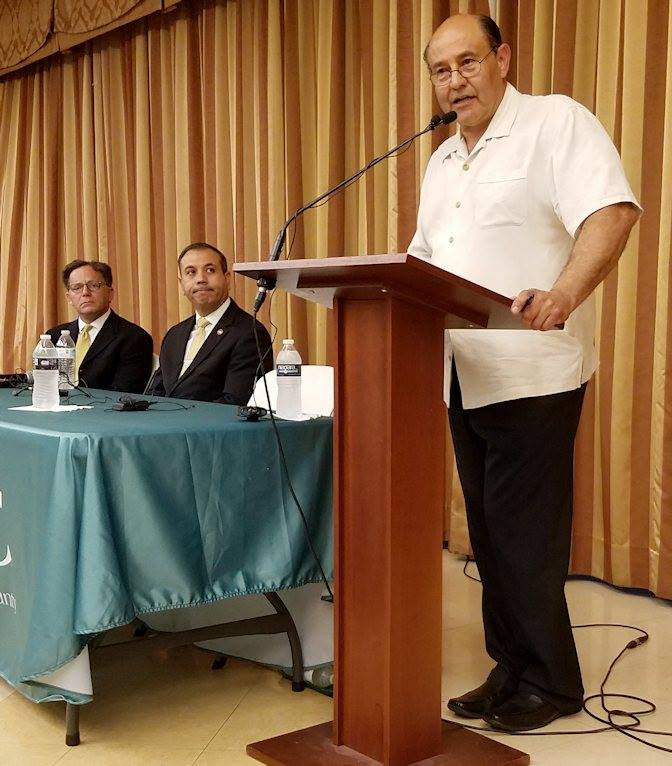 Congressman Lou Correa, State Senator Tony Mendoza and State Senator Josh Newman. Each of the public officials spoke about the policies they have spearheaded or advocated for in support of Muslims and immigrants. The officials ended their segment by urging community members to have open communication and work with them on ways to address the challenges caused by anti-Muslim policies. The Stronger Together panel was a message from local interfaith leaders who discussed how their faith values commanded them to stand in support of their Muslim brothers and sisters. The panelists included Reverend Sarah Halverson-Cano of the Fairview Community Church in Costa Mesa and Rabbi Heidi Cohen of the Temple Beth Sholom in Santa Ana. The panel concluded with remarks from Anaheim City Councilman Dr. Jose Moreno. 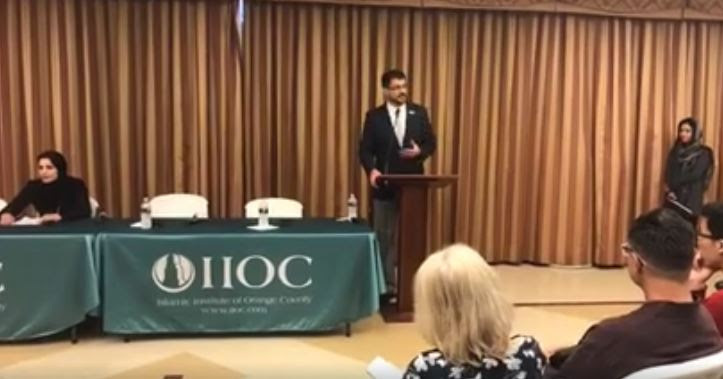 Dr. Moreno is also the president of Los Amigos of Orange County, which is a member organization of the recently formed Muslim-Latino Collaborative. Councilman Moreno spoke about the value of the collaborative as a tool to amplify the voices of the local Muslim and Latino communities in the pursuit of unity and justice for all. 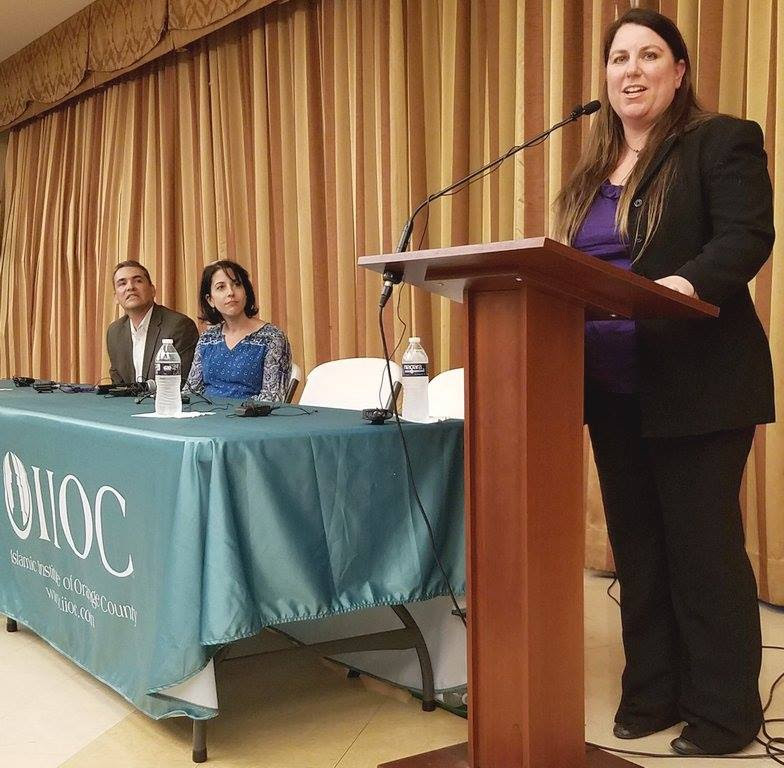 The final part of the event was a “Know Your Rights” panel presented by CAIR-LA Advocacy Manager Masih Fouladi, AAAJ-LA Litigation Director Laboni Hoq and World Relief Refugee Program Manager Jose Serrano discussed the Muslim Ban 2.0 and educated community members on their rights. They also talked about resources available to community members to help them protect their civil liberties. The town hall concluded with a Question & Answer session. The attendees asked a wide range of questions on policy and law enforcement issues, making for a lively discussion.